Get all the details you need to survive and succeed on this ruined Dutch battlefield. Rotterdam’s beautiful and complex architecture built tall by hands and machinery now rests scattered as heaps of rubble in Battlefield V’s Devastation map. The range, trajectory, and explosive yield of bombs dropped from above have reshaped the city into a no-man’s-land of ash and remains for soldiers to fight over. This survey of the Devastation map will help players find their way in the dark, unrecognizable streets. The map is inspired by the second part of the Rotterdam blitz by the German forces. 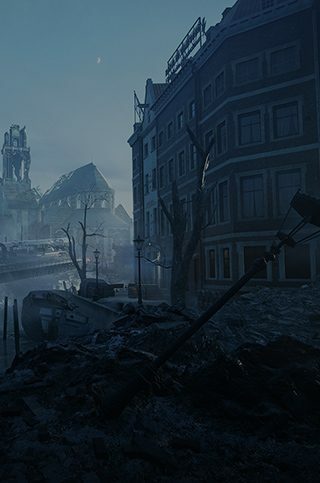 The Rotterdam map shows a thriving city in peril, while Devastation is a nearby section of the same metropolis, ruined by the terrible aftermath of relentless bombardments. Devastation is an unconventional Battlefield map marked by periods of intense close-quarter firefights, created by the same mind behind Battlefield 1’s Fort de Vaux. Direct roads have warped into an aimless blend of claustrophobic avenues of approach, obstacles, and defensive positions. Players will have to fight among these ruins, dried out canals, and the metal skeletons of buildings. Several places, most notably the cathedral, still retain their shape and can be used as defensive strongpoints. The abundance of cover left by the bombardments works both ways, so you’ll have to outsmart your enemy and not get trapped in a meat grinder. Final Stand – There can only be one team left standing, and this tie-breaking conclusion to Grand Operations will determine the winner. Days three and four of the Battle of Holland Grand Operation – which begins in Rotterdam – take place here. Grand Operations are the ultimate multiplayer experience that takes players across fictional in-operation “days,” where each day is represented by a round played on a combination of a map and mode that brings the war narrative to life. The actions you, your squad, and your team take on day one will impact gameplay in day two, as well as day three, and so on. Up to 64 players battle for what’s left of the city on day three in Frontlines and if neither side has been ground to defeat, day four will exhaust combatants to the last soldier in Final Stand. This collection of destroyed trains and tracks is the nearest Flag for the Axis and the best place to stage a takeover of Flag C, the central hub of Devastation. The overturned platforms provide an elevated perch to hold off incoming foes. What’s left of the train tracks can be used to move to the outskirts of Flag D to either deny an attack or contest the site. One of the few recognizable landmarks within Devastation, Flag B operates as a flanking position for either Axis or Allies. Bombs have shaved the top from the library, leaving every room with a view but, thankfully, all planes are long gone. What’s left of the walls and doorways across the three floors are good interior hiding spots, requiring a constant patrol to keep enemies out. This is the centerpiece of Devastation. The monochromatic grey walls are colored by kindled pyres and whatever light can pierce through the smoky sky. This is where squads coordinate with all four Classes to wage non-stop, hectic battles to capture this massive landmark. Claim the location and brace for a barrage from all sides, since Flag C is surrounded by every other capture point. To the east is the last reminder of a modern city. The intact neon signs light the way to a Flag enclosed by shattered glass, steel, and rubble. A few rows of seats still await an audience, but the cinema is only showing one film genre these days: war. Flag D is the natural expansion point for the Allies, who can move on the train tracks to attack Flag A or stage an assault on anyone unfortunate enough to get caught leaving the cathedral. Flag E is ideal for the Allies and an obvious maneuver point into the cathedral. The involuntary outdoor mall is ripe for urban skirmishes between what’s left of the outer walls. The ground floor has caved into the parking garage below, creating another arena for control. If you captured this Flag but not the nearby Flag C, try to look up, because the mall faces the tallest side of the cathedral, where a good Recon or Assault player can pick off careless soldiers. 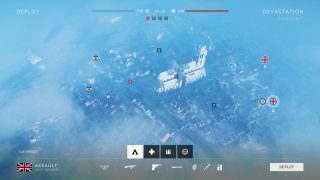 Check out how to play on the rest of the eight launch maps so you’re prepared when you hit the battlefield: Narvik, Fjell 652, Rotterdam, Devastation, Arras, Twisted Steel, Hamada, and Aerodrome.